Mental Health Service Dogs open doors for people with psychological disabilities. Imagine having a dog that could help you become a part of the world again. Enhanced Quality of Life and Personal Freedom. Heeling Allies Service Dogs are highly trained to enhance the lives of their handlers by helping them to live independently. Each Heeling Allies Service Dog is tailor trained to meet the specific needs of the individual with whom they will be placed. These talented dogs are trained to help their handlers within the home, as well as outside of the home. Heeling Allies, Mental Health Service Dogs are trained to perform tasks that help ease debilitating symptoms of some psychological impairments. Disabilities served include, but are not limited to, Posttraumatic Stress Disorder (PTSD), Acute Anxiety Disorder, Panic Disorder, Agoraphobia, Obsessive Compulsive Disorder (OCD), Generalized Anxiety Disorders, Mood Disorders, Asperger Syndrome, and Tourette Syndrome. 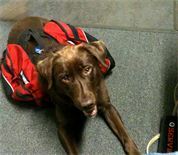 Listed below are examples of some of the many tasks Mental Health Service Dogs can be trained to do for their handler. Heeling Allies Mental Health Service Dogs extensive formal training before being paired with a recipient. While in training, these special dogs learn to master advanced obedience skills, specialized task training and public access skills, so that upon graduation they are prepared help their handlers where and when they need it most. – L.R., and Heeling Allies Service Dog, Blue.